During 2005-2007, ERD conducted field and laboratory investigations to quantify the impacts of existing sediment accumulations in Lakes May, Shipp and Lulu on water quality and to evaluate options for managing these sediment impacts. ERD conducted water and sediment depth surveys in the three lakes to develop water and sediment depth contour maps. Field monitoring was conducted from October 2005-April 2006 to evaluate hydrologic and nutrient loadings to the lakes. 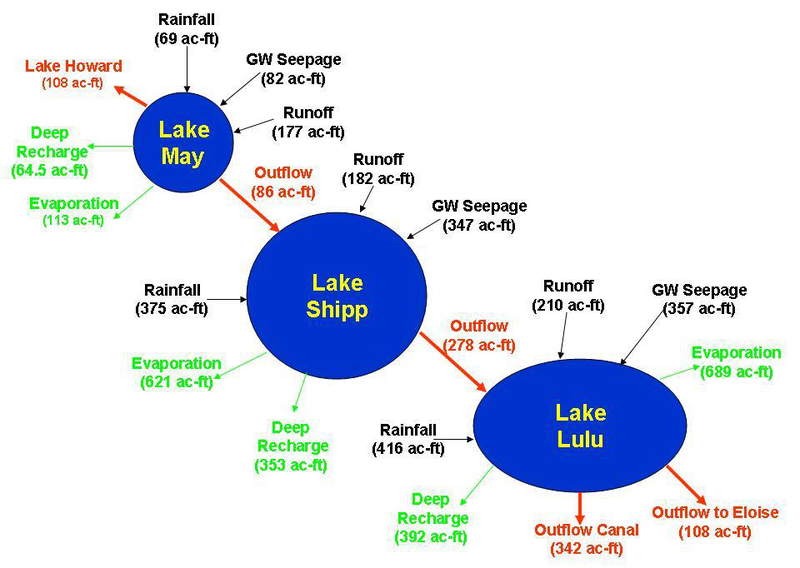 Significant tributary inflows/outflows and inter-connected lake flows were monitored on a bi-weekly basis for both discharge and water quality characteristics. Hydrologic instrumentation was installed in the basin area to continuously record rainfall, evaporation, and water levels. A bulk precipitation collector was used to quantify inputs from precipitation. A total of 26 shallow groundwater seepage meters was installed to quantify the quantity and characteristics of seepage inputs to the three lakes. Over 50 sediment core samples were collected to characterize sediment quality and horizontal distribution. A stormwater monitoring program was conducted at three inflow sites, and continuous baseflow and runoff samples were collected over a period of 6 months. Large diameter sediment core samples were collected in each lake and incubated under oxic and anoxic conditions to quantify sediment internal recycling. 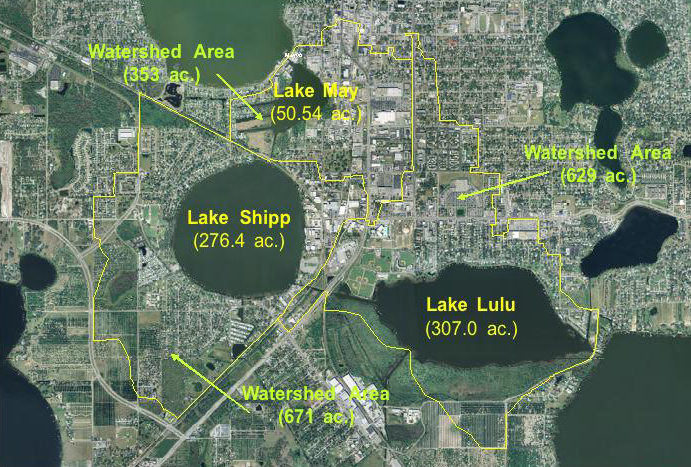 Detailed hydrologic and nutrient budgets were developed for the three lakes which included inputs from precipitation, stormwater runoff, dry weather baseflow, groundwater seepage, tributary inflows, and internal recycling. An inter-linked hydrologic and water quality model was developed for the three lakes to evaluate water quality impacts from evaluated management options. Existing sediment accumulations were determined to have a large impact on water quality in the three lakes and represents the single largest phosphorus source to the lakes. Resuspension of sediments was observed during windy conditions with measurable increases in total P and TSS. A significant degree of phosphorus release was observed during both oxic and anoxic conditions. The water quality model indicates that removal or inactivation of existing sediments will have a significant positive impact on water quality in the lakes.